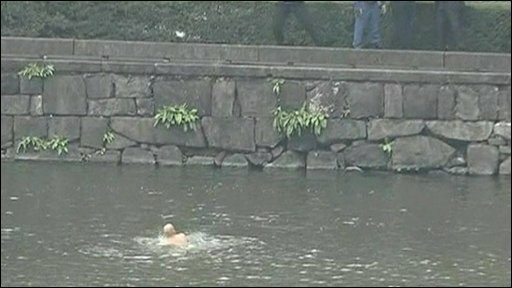 A tourist has been arrested after swimming naked in the moat of the Imperial Palace in Tokyo. The man spent an hour in the water before he tried to make his escape. He hurled rocks at police and charged at them with a long stick, before jumping back into the water. He then tried to make a getaway by climbing the moat wall, only to find police waiting for him at the top.